NetEnt cuts the wheat from the chaff with its High Limit version of its Professional Series Blackjack. With minimum bets starting off at 25.00 and ranging up to 500.00. This online casino game is certainly one for those with a decent bankroll to play with. 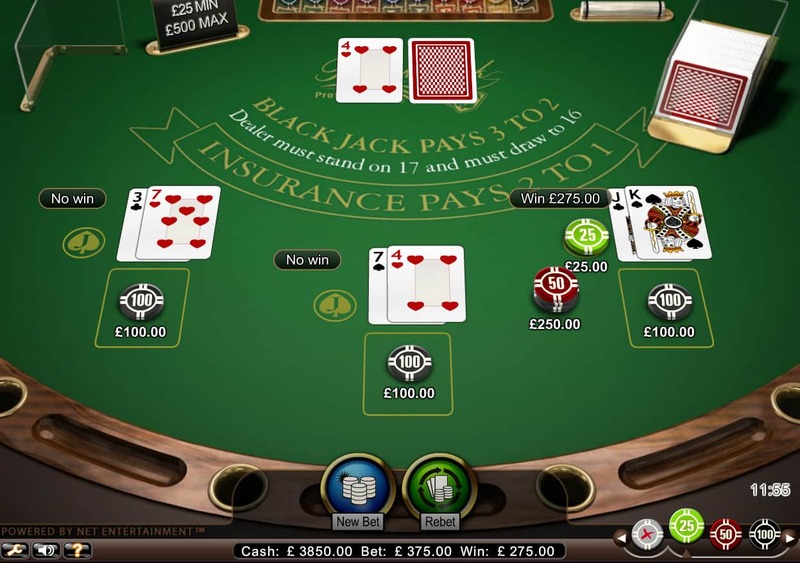 As with its other Professional Series Blackjack variants, NetEnt returns its Double Jacks side bets. With payouts of up to 100:1, these bets aren’t to be sniffed at and send our potential payouts from this game into the stratosphere. It’s difficult to imagine an online Blackjack game set at any other view than from a players-eye-vie. Not only does it seem more realistic, but it also provides the best possible viewing angle. The nuances, then, come in the finishing touches, the flourishes that elevate a game above the others. NetEnt’s excellent graphics see our cards dealt swiftly to the accompaniment of top-notch sound effects that cut through the background jazz. It is as though an expert Dealer were behind the table. We have the option to speed up or slow down the game-play as we so choose, ranging from the Sunday afternoon lethargic to the dealt-by-robots hyperspeed. Realism is, of course, optional. Easy bet features like Rebet and New Bet allow us plenty of room for strategy, while the game rules and payouts are also easily accessible and clearly set out. 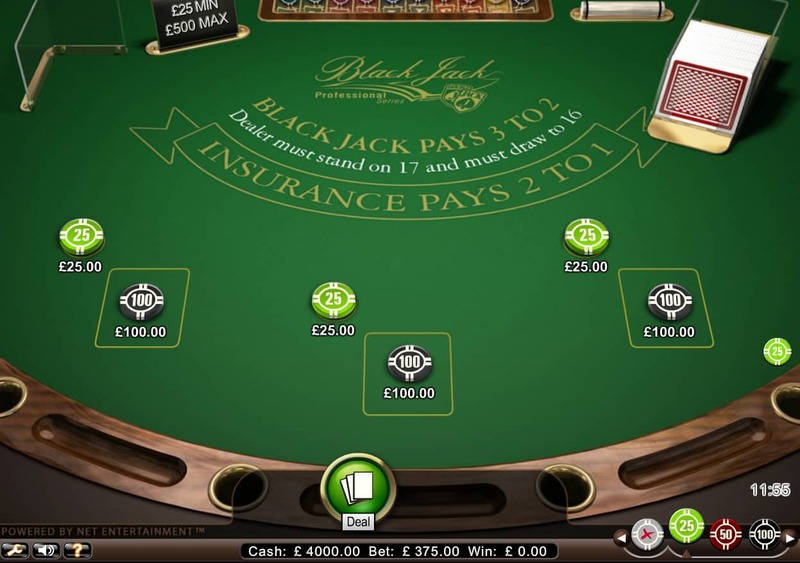 NetEnt’s Double Jacks bonus game side bets play an important role in Blackjack Professional Series High Limit. Not only in terms of game-play but also when we are eying top payouts. We play with four standard decks of cards, which means that we could potentially land two pairs of Jacks of Spades, each delivering a cool 100:1 payout. Plus a 25:1 payout for a pair of other Jacks brings our side bet maximum potential payout to 112,500.00, dwarfing our maximum payout of 16,000.00 from three hands of Blackjack, each split and doubled. Otherwise, scoring Blackjack sees us land a 3:2 payout and insurance wins earn 2:1. But with NetEnt allowing us to double after splits, our top payout sits at an impressive 4,000.00 per hand. The slick graphics and smooth game-play on display in Blackjack Professional Series High Limit make this a must-stop table on our online casino game floor. But it is in the Double Jacks side bets and maximum payouts that high rollers will be particularly interested. 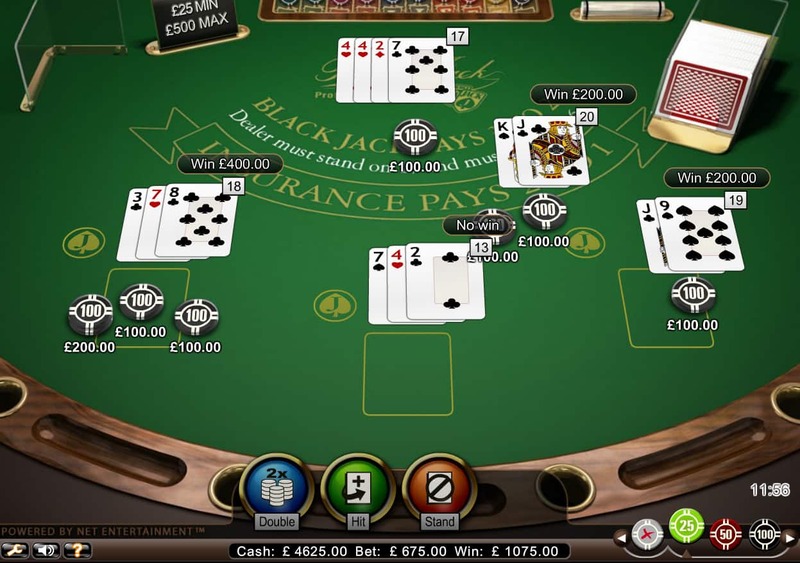 The option to play multihand games - with our Double Jacks bets set at the same level as our Blackjack max bets - means that there is plenty of payout potential on offer here. Not that you would ever doubt NetEnt to deliver, and deliver it certainly does.